Want to impress your date? 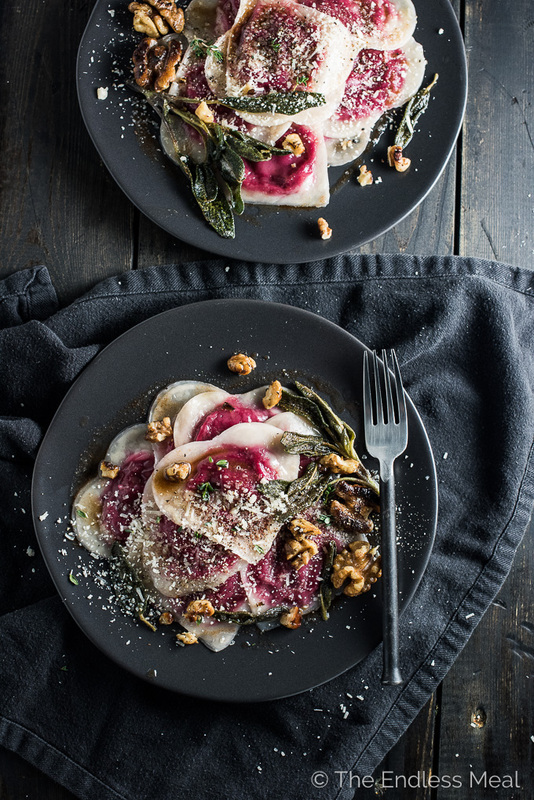 Make them Beet and Goat Cheese Ravioli tossed in brown butter and sprinkled with crispy sage and walnuts. It'll be our secret that the ravioli is made with wonton wrappers and is SUPER easy to make. Wonton ravioli is a perfect Valentine's Day dinner recipe or for anytime you're looking for something a little extra special. You guys! I've made us the prettiest pink, lovefest pasta ever, and I'm only a tiny bit embarrassed about it. ? All year, I walk around like I'm too cool for girly stuff like pink and hearts. I wear black. I drink bourbon. I (think) I'm badass. 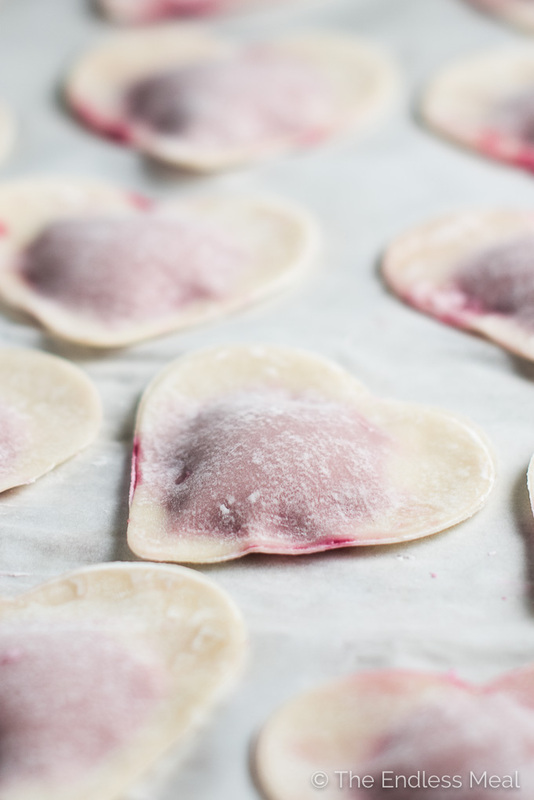 Then Valentine's Day comes around and I'm all like, “Let's make pink heart-shaped ravioli!” Ya, so badass. ? My overuse of emojis and exclamation marks should have given away my non-baddass-ness long ago. 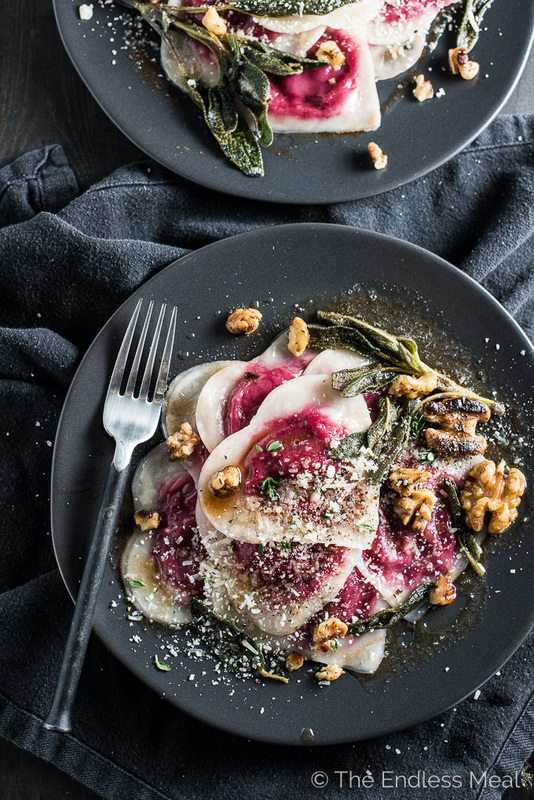 I'm making no apologies cause this Beet and Goat Cheese Ravioli is just too. damn. delicious. And you should never apologize for being this pretty. You need to know something about this ravioli. This is no ordinary ravioli, my friend. This is … wait for it … WONTON ravioli. That's right, these babies are made with wonton wrappers. Say what???? I may never make regular pasta again. Here's the thing with wonton wrappers: they're made with flour, salt, and eggs. Here's the thing with pasta: it's made with flour, salt, and eggs. Wonton ravioli might sound super strange, but it's basically the best pasta hack around. It tastes about 95% like regular ravioli and the last 5% doesn't matter cause it's drizzled with brown butter and sprinkled with crispy sage. Seriously, no one is going to complain that you didn't roll your own dough like an Italian Nonna. Tell me, where are you with the whole beet thing? I'm on team Can't Get Enough Beets. They're sweet, they're earthy, they're omgeee give them to me. 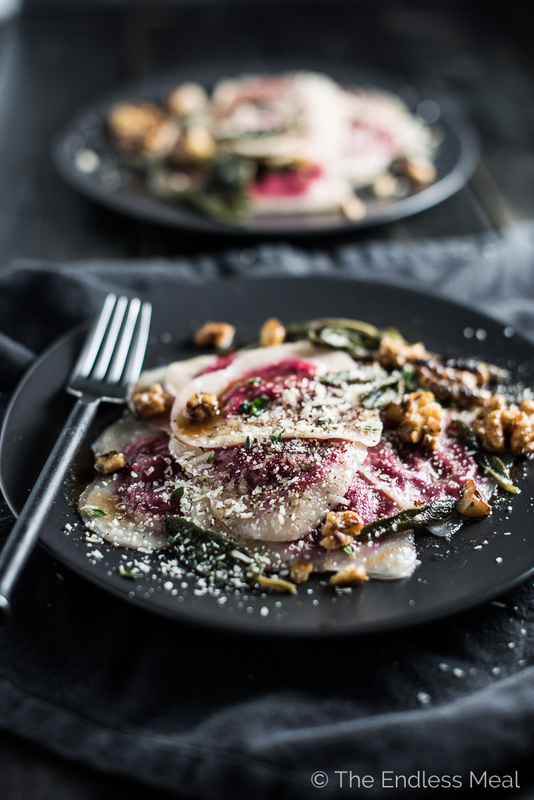 Mash them up with some goat cheese (umm, beet and goat cheese ravioli) and I can't stay way. 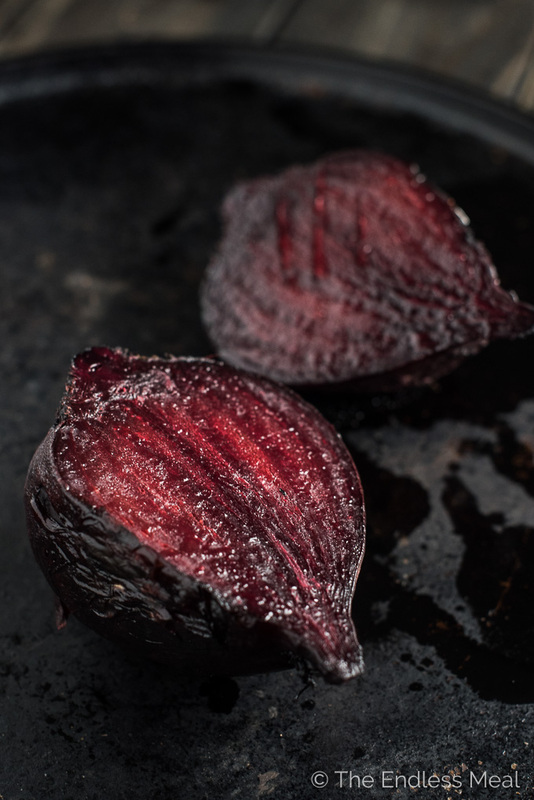 The thing with this beet and goat cheese ravioli recipe is that the beets don't play center stage. They're more of a supporting role, backing up the brown butter and cheese. Can we have a moment for brown butter, please? Is there anything better than butter cooked till those little specks of nutty brown flavor bombs appear and then drizzled over pasta? I'm so happy the whole ‘saturated fats are bad for you' thing has been called off as a scam. (And thank you sugar industry for bribing scientists and depriving us of butter for years.) I say we make up for lost time and double our brown butter drizzling efforts. If you're making this for the big love day coming up (or if you're a cheeseball all year round) you can cut your wonton wrappers into heart shapes. Make a small stack, take a cookie cutter, and stamp out your heart-shaped ravioli. Or you can be a regular person and leave the wonton wrappers as they are. I have no doubt that if you go this route it means you're way cooler than I am. → Sidebar ← Do people even say ‘cool' anymore? I think it just dated myself. 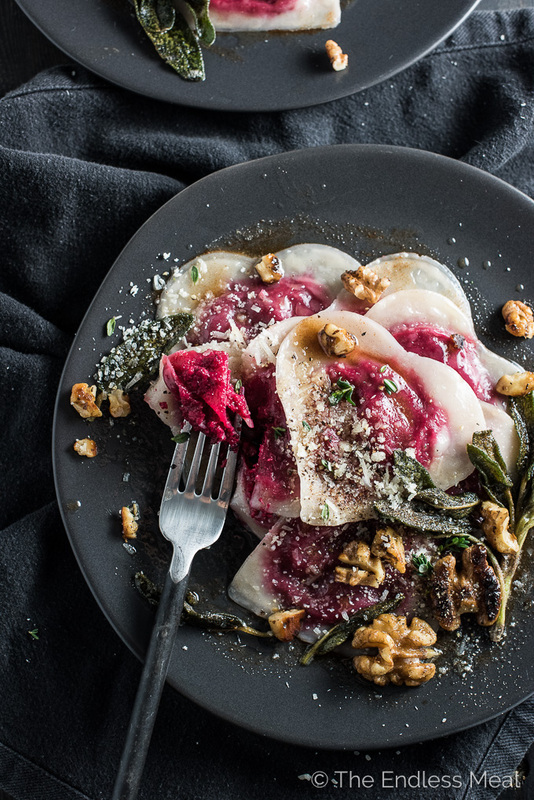 Anyway, whether you're a true badass or a cheeseball like me, you're going to be all over this wonton beet and goat cheese ravioli recipe. Set your oven to 420 degrees. Wrap the beet in aluminum foil and pop it in the oven. 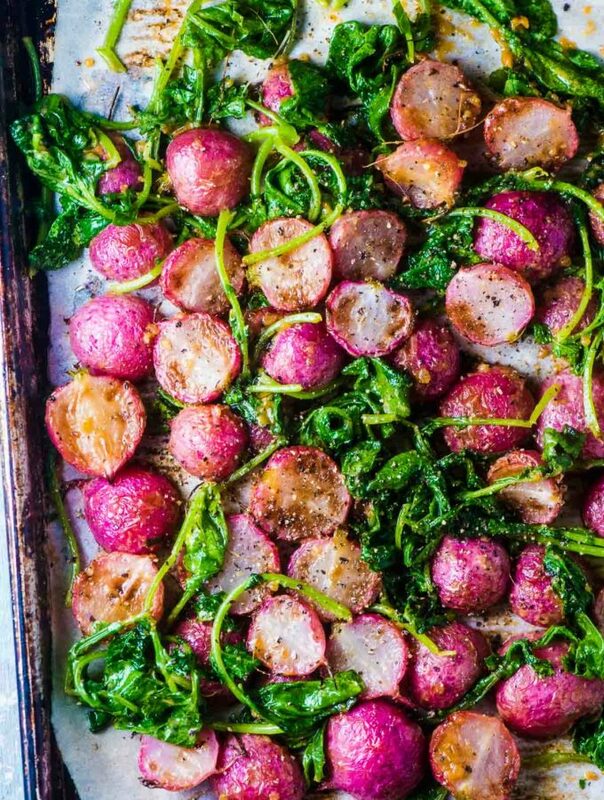 (You don't have to wait for the oven to pre-heat.) Let the beet roast for 1 hour. Remove it from the oven, unwrap the foil, and let it cool slightly. When the beet is cool enough to handle, cut off the ends and peel the skin. 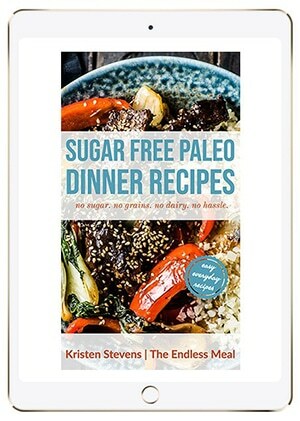 Cut it into chunks and put it in your food processor. Add the goat cheese, parmesan, and thyme leaves and process on high until smooth, about 2-3 minutes. Season with sea salt and black pepper, to taste. While the beet is roasting, prepare the rest of the meal. Place 1 tablespoon of the butter in a small frying pan over medium-high heat. Let it boil for 2 minutes, then add the sage. The sage will be crisp, and the butter will be brown after about another 2 minutes. Keep your eye on it as you don't want the butter to burn. Add the remaining tablespoon to another small frying pan over medium-high heat. Add the walnuts and let the toast for 4-5 minutes, or until they are fragrant and just start to brown. If you'd like, cut the wonton wrappers into heart shapes by using a heart-shaped cookie cutter. Stack them and cut them 4 at a time. Line 2 baking sheets with parchment paper. Lay out half of the wonton wrappers on the sheets. Place a heaping teaspoon of the beet and goat cheese puree in the center of each wonton wrapper. Working with 3-4 at a time, wet the wrappers around the edges with a little water. You can use a pastry brush or your finger. Lay another wonton wrapper over the top and press the edges firmly together. When the water comes to a boil, add the wonton ravioli all at once. Stir the pot after you add them then let them cook for 2 minutes. Set a timer! 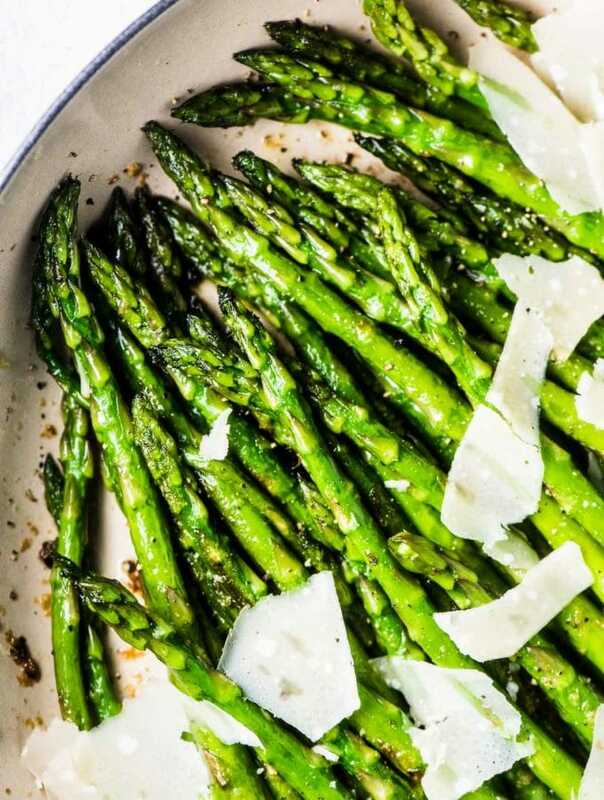 You don't want to overcook these. Drain the ravioli through a colander then return them to the pot. Drizzle some olive oil in the pot (like you do with regular pasta) and add a spoonful of the brown butter. Toss gently to coat. 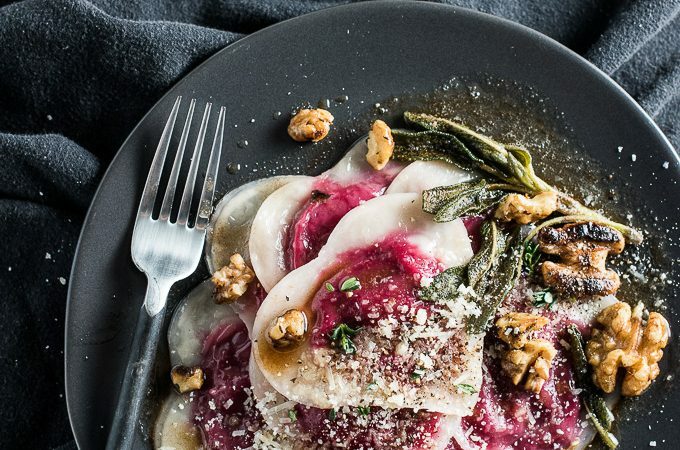 Divide the wonton ravioli between two bowls and top with the remaining brown butter, crispy sage, and the walnuts. I would be tempted to pair it with the brown butter and go with a lightly oaked chardonnay. Hope you guys have a great Valentine’s Day! !